Tikosyn (Dofetilide) is used for certain types of serious or possibly fatal irregular heartbeat like atrial fibrillation/flutter. This is used to restore normal heart rhythm and maintain a regular and steady heartbeat. Treating an irregular heartbeat can decrease the risk of blood clots. Its effect can also reduce your risk of heart attack or stroke. How does Tikosyn (Dofetilide) work? Tikosyn (Dofetilide) shows Vaughan Williams Class III antiarrhythmic activity. The mechanism of action is a blockade of the cardiac ion channel carrying the rapid component of the delayed rectifier potassium current. At concentrations covering, some orders of magnitude, this drug blocks only with no relevant block of the other repolarize potassium currents. At clinically relevant concentrations, this has no effect on sodium channels, adrenergic beta-receptors, or adrenergic alpha-receptors. This medication blocks the activity of certain electrical signals in the heart that can cause an irregular heartbeat. 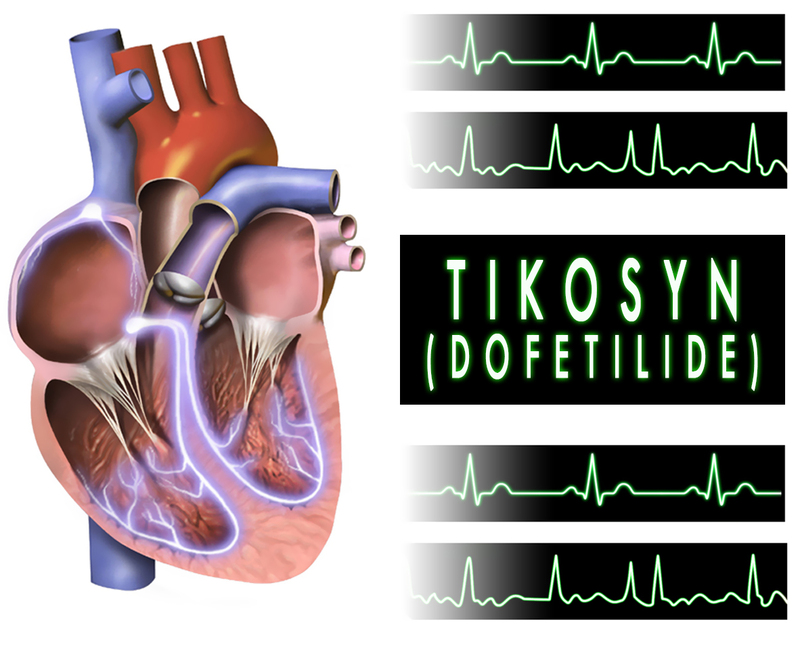 Tikosyn (Dofetilide) is known as an anti-arrhythmic drug. It is with Class III or cardiac action potential duration prolonging. It contains Dofetilide which is a white to off-powder and very soluble in water. This is available as tablets for oral administration. This medication has the strengths of 125mcg, 250mcg, and 500mcg. The Food and Drug Administration (FDA) has approved this medication already. How to use Tikosyn (Dofetilide)? The recommended dosage for this medication is based on your medical condition and response. This is to be taken by mouth with a full glass of water. It is usually taken twice a day. You may take it with or without food. Use it regularly to get the most benefit of it. To decrease the risk of serious side effects, it is very important to take it exactly as it is prescribed. What are the side-effects of Tikosyn (Dofetilide)? Before taking this medication, let your doctor know if you have any medical history or current medications. Tell also to your doctor if you have any allergies. Do not drive or do anything that requires your alertness. This drug may make you feel drowsy or dizzy. Keep this away from heat or moisture.